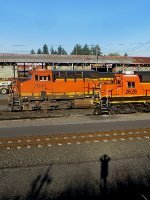 Description: BNSF 2628 someone doesnt believe in weathering their freshly detailed power units - just glowing in morning sun at the Pasco yard. Description: That shadow self-portrait - wouldnt that make it a shelfie? (Sorry to include a second one this month, but trying to ensure the IRS believes me when I say I was out doing what I said I was doing... not off playing tennis or something).